Commercial Splash Pads / Splash Parks are popping up everywhere today! They are extremely popular for their safety and the interactivity they bring to places such as amusement parks, zoo’s, large resorts, city parks, and more. Concerned with high-traffic and heavy wear-and-tear? Rain Deck Commercial Line of Splash Pad / Splash Park Products is highly sought after for its durability, affordability and design. Rain Deck’s stainless steel commercial features are strong, durable, and carry an unmatched 25 year warranty. Additionally, most Rain Deck commercial features come equipped with a stainless steel footing base, making those features removable and interchangeable at no additional cost. DURABILITY: With a comprehensive Stainless Steel product line, Rain Deck delivers to each splash pad the reliability that is critical to a commercial splash pad / splash park. 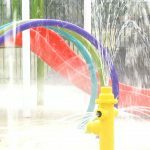 All components of a high traffic commercial splash pad need to be robust so that they can perform day in and day out, under all aspects of stress and use. Rain Deck provides the highest quality of stainless steel products that can hold up and perform flawlessly under all environments. Rain Decks distinctive advantage to any commercial splash pad is providing our clients with the ability to interchange stainless steel above ground water features with our Rain Deck Footing Base. AFFORDABILITY: Rain Deck provides Commercial Splash Pad products that have been refined through in-house testing and comprehensive customer feedback. Because of our processes we have identified the most popular and effective commercial products that fit in a wide variety of splash pad designs. At Rain Deck we work by the rule that we perfect the best products so that our products stand the test of time; and in turn, save you money. With continual refinement and innovation of our popular products, Rain Deck is able to pass the savings onto our customers. Contact one of our professional sales representatives to learn about our Rain Exchange Program™ to learn how to keep the most popular and latest features on your Splash Pad at affordable prices. DESIGN: At Rain Deck, we know that commercial splash pads vary widely in their location, application and use. We work hand in hand with our customers to bring their visions to reality. With the unique ability to customize even the smallest feature, Rain Deck is your source for tailored splash pad / splash park products. 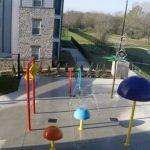 Whether it’s a unique color scheme or a one of a kind feature, our design and engineering department is available to meet any need for our commercial splash pad clients. Fill out the form or give us a call to see how we can help you put together your dream splash pad for your commercial site!